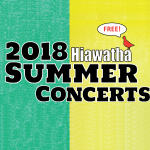 Admiral Neighborhood Association present another six nights filled with music at Hiawatha Park beginning Thursday, July 23rd when we welcome Carrie Akre. We will welcome a new musical act each Thursday evening through August 27th. Bring a blanket and pack a picnic, we hope to see you on the east lawn being the community center. Visit the Summer Concerts page for a complete list of all the musical talent.